The Certified Aging in Place Specialist (CAPS) identifies those that have been trained to help seniors and older adults in their homes as they age. The National Association of Home Builders (NAHB) and NAHB Remodelers created the CAPS designation program in collaboration with Home Innovation Research Labs, NAHB 5o+ Housing Council and the AARP. The CAPS trained professional understands the needs of the aging population, common remodeling projects and expenditures, codes and standards, product ideas and resources. 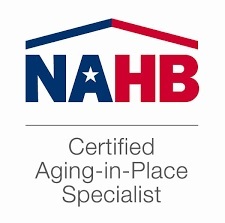 A CAPS professional can help you make your home “aging-ready.” Working with a certified aging in place specialist gives you the assurance that you are dealing with someone who is experienced in crafting solutions that meet the independent housing needs of older adults. CAPS professionals utilize universal design principles to create a safer, more comfortable and more independent life in their own home, both now and in the future.